Chateau / Country House86111 sq. ft. This wonderfully restored Georgian country house offers the perfect retreat either for a quiet, luxurious weekend, or bring the house to life with festivities and party celebrations. Step through the classic entrance doors to Ewelme Manor and discover this beautiful Georgian home. Designed by Anthony Keck in 1760 and once a 'Coming of Age' present to the late William Purnell, Ewelme Manor is the architect's earliest identifiable Gloucestershire country house, also closely associated with Highgrove, Berkeley Castle and Rodborough Manor to name just a few. The perfect house for entertaining in style, with a superbly equipped kitchen, the Aga, with companion, warming the heart of the home, numerous impressive reception rooms, all with magnificent period open fireplaces, and a recently added outdoor pool complex with cinema room, provides a more contemporary 'spa like' feel and an additional entertaining area. Start your day by taking morning tea under the verandah by the fountain. Enjoy a long, leisurely lunch with family and friends under the pergola on the south facing patio, overlooking the pool. Sip a cocktail before dinner in the study in front of the open fire and then dine with style in the 17th century dining room. Alternatively, you could just cosy up on a feather sofa in the 'snug' with the flickering flames of the wood burner, or settle down in front of a movie in the cinema room - the choice is yours to make. Take the time to unwind in one of the marble-clad bathrooms in an elegant roll top bath before retiring to your choice of spacious bedrooms, sumptuously furnished. The perfect end to the perfect day! Ewelme Manor even offers a 'feature bedroom' that your children will love! With a huge variety of local attractions and sporting activities and entertainment, it makes Ewelme Manor the ideal choice for adult and family celebrations alike, steeped in English History and classic Cotswold charm. Experienced Bristol property renovator and interior designer, grew up in Hampshire but moved to Bristol and then to settle in the Cotswolds. We chose the Manor because we fell in love with it as soon as we saw it. It's made a beautiful family home in a fantastic location. 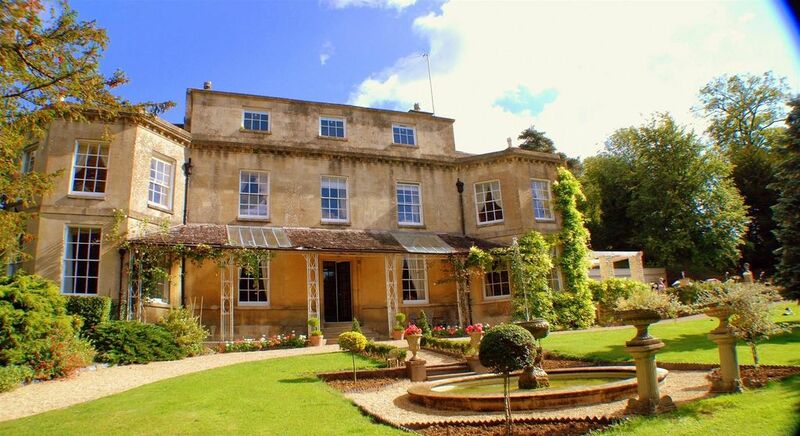 A little quirky, certainly interesting, historical and with an abundance of Cotswold charm. The views across the valley of the rambling Cotswold hills, the incredible gardens, with natural springs, the sound of running water and the centrepiece fountain. The house is welcoming and wonderful, full of light and love with original Georgian features and quirky curved hallways, magnificent large south facing rooms and a beautiful, contemporary kitchen with glass gable, overlooking the outdoor pool and gardens and 250 year old Copper Beech. Step out of our gates directly on the famous Cotswold Way where you can ramble to the nearest pub, enjoying the much loved Cotswold scenery along the way. All this and every local amenity you could need within 5 minutes of the Manor and activities and venues a stones throw away. All bathrooms are finished to a high standard with marble or limestone tiles, vanity units and generous sized baths and showers. The formal dining room seats 22. The kitchen table seats 8. The outside dining area also seats 20 +. Indoor and outdoor with iPod docking station. Various CD players located throughout the Manor. There is a music system for the kitchen and outside pool area. Please bring your own iPod. The playroom houses a selection of toy cupboards and large flatscreen TV and Wii. Small selection games provided. Private outdoor heated pool on south facing terrace with pool house facilities. It is an amazing place but I knew that already!!!!! We had a family and friends get together for our Golden Wedding Anniversary. It was exactly fifty years to the day that I left the house to get married. My parents were in charge of Ferney when it was a home for the elderley, this required our family to live on site, so it was our family home for many happy years. Some parts of Ferney had obviously changed but it still had that same homely atomosphere. It evoked many memories and I don't think we stopped exchanging reminiscences all weekend. Stephen and Candida are excellent hosts and made our stay absolutely perfect. Homely and generous property with well-equipped kitchen for large parties. Bedrooms gorgeous! We rented the property to celebrate a special birthday. Pre-arrival contact and information was very responsive and informative. Warm welcome from hosts. Very comfortable property for our party of 11. We made good use of the kitchen facilities and the children enjoyed the Wii and pool table. Local town with all amenities including good butcher nearby. The million dollar question is would we stay again and the answer is absolutely. We had a large family gathering for NY and had a great time at this fantastic house. The kids loved that they had their own play room with a TV, games, movies, so plenty for them to do, but even though it was winter they spent most of their time outside exploring and playing in the lovely (and safe) garden. The kitchen is a really lovely homely space and so well equipped that there was nothing we were left searching for and were able to cook some great meals. The pool table was a real hit with everyone. The owners were very helpful but everything we needed was in the house so didn't need to call on them. Overall everyone had a comfortable stay and we loved it so much that we will likely be back one summer so that we can also enjoy the pool! We have just had Pre-Christmas in the Manor house at the beginning of December as we are not able to spend the real Christmas with my family this year. Everything about the weekend was perfect. The owners had decorated the house beautifully with trees and fairy lights and we spent a wonderful few days relaxing in the comfort of the lovely old house. To make things even easier we hired a chef to cook Christmas dinner on Saturday night. The meal was fantastic and it was all washed up and cleared away for us! We will definitely be back in the summer so that we can make use of the outside swimming pool! Thank you again for a fabulous and memorable weekend. Absolutely fantastic. The place was perfect. Exactly as looked on line if not better. This place was perfect for celebrating my 40th birthday. All rooms were of varying sizes but equal on character and suitability. We had great weather so the pool area was amazing. The hosts made everything simple from start to finish and couldn’t have been more helpful. A wonderful weekend away to celebrate my 80th birthday with my adult children and grandchildren. Weather was fantastic and we spent most of our time in the pool. Some walked on the Cotswold Way with our two dogs. We didn't want to come home! The Cotswolds, also known as 'The Heart of England', are the hills and valleys that make up the two famous counties of Gloucestershire and Oxfordshire, drifting into the boundaries of some of the neighbouring counties. Literally translated as 'sheep enclosure in rolling hillsides',The Cotswolds is an area characterised by attractive small towns and villages built of the underlying, famous golden coloured Cotswold stone. In the Middle Ages the wool trade made the Cotswolds prosperous as it still remains today, and some of this money was invested into the building of churches so the area has a number of large handsome Cotswold stone 'wool churches'. Designated as an area of Outstanding Natural Beauty, the rolling hills and hidden valleys hide picturesque villages, period Rectory's and Stately Homes nestled amongst, without a doubt, some of the most beautiful scenery in the country. Home to the Royals and with the famous cities of Bath, Cheltenham and Bristol on the doorstep, the area offers something for everybody - outdoor pursuits, scenic walks, city thrills or extreme sports. From the serenity of walking the Cotswold Way to a day out at Cheltenham Gold Cup, you won't be disappointed! The house is situated in an elevated position with far reaching views across the Uley Valley, in a conservation area and a designated area of Outstanding Natural Beauty. The famous 'Cotswold Way' walk is directly outside the gates and if you prefer walking, a gentle stroll into the local town takes less than 8 minutes with all your local amenities at hand . There are a huge amount of local activities available to suit a wide variety of interests from relaxing to the more extreme sports, and many historical places of interest if you're looking for culture. From 'Highgrove' to 'Cheese Rolling', you'll find plenty to entertain. * Trains - Kemble (1hr 15 mins) Also Stroud and Bristol offer direct fast track to London. Collection can be arranged.